Hotel Faber welcomes you to new hotel apartments in the very center of Aarhus. 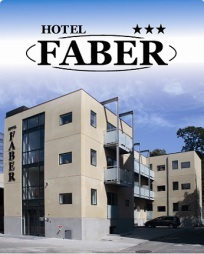 Hotel Faber was build in 2010/2011 and has double rooms, 1, 2 and 3 rooms apartments. All rooms and apartments are equipped with kitchen and bath room. With the absolute best possible location, next to the music hall, the Aros artmuseum, The Old Town etc. Hotel Faber is the obvious choice when planning your stay in Aarhus. 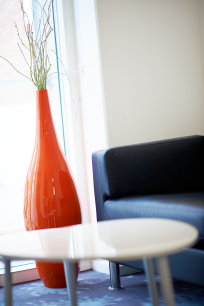 With reception during the day and 24 hours self check in, the stay at Hotel Faber starts at your convenience. It is possible, to have your car safely parked behind a locked gate. All rooms and apartments are equipped with new and modern inventory, in the Scandinavian style. Our stylish kitchens makes every stay, long or short a true pleasure. Whether you are preparing a meal for a nice evening in or just a cup of coffee, you will find everything you need, when you need it. It is our wish, that every room or apartment is so comfortable and practical in use, that it feels like your home away from home. This regardless of your type of stay, holiday with your family or pure business. It is very important to us, that Hotel Faber is a hotel of possibilities and not limitations. This is why, we emphasise quality and functionality, right from our pillows to check-in, our launderette, and the speed of our hot-spots. All this is kept in high quality, without charging more than the price of an ordinary hotel room. The Hotel Faber is a non-smoking hotel. At Hotel Faber you will find possibilities and no limitations. 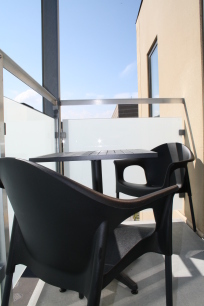 This is why we consider ourselves the perfect choice for your next stay in Aarhus.